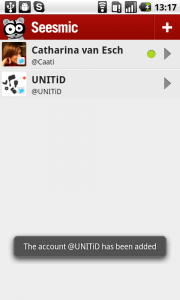 On the account overview page, where now 2 accounts are listed, the user can tap a button saying ‘Add account’. A username and password have to be entered, and the ‘Sign in’ button tapped to actually sign in. A progress dialog shows that the account is verified. When finished the 3rd account is listed. 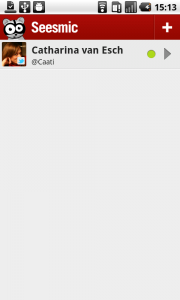 And a toast message confirms that the account was added. 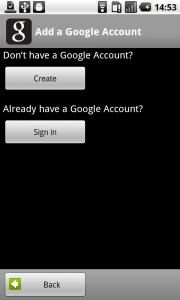 In some applications it is also possible to add an account using the options menu. 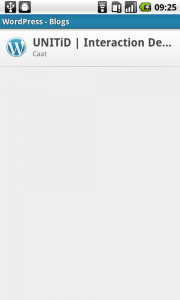 1 On the accountpage in Gmail, all accounts that are active are displayed. 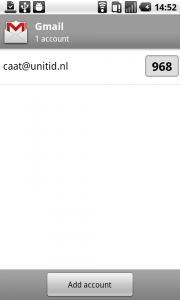 Here it's one mailaccount. At the bottom of the page, the user can tap a button ta add an account. 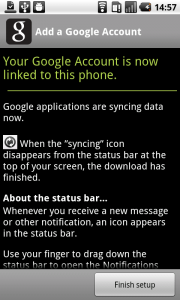 2 If the user doesn't have an other google account, he can create one by tapping the top button. Here we choose to sign in. 3 Username and password have to be entered. 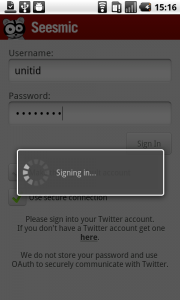 4 When username and password are entered, and the keyboard is closed, the button to sign in can be tapped to continue. 5 Adding a new account is finalized by tapping on the 'Finish setup' button. 6 We are taken back to the accounts page, where the second gmail account is shown. 1 In Seesmic adding a account can be done by tapping the + button on the top right in the action bar. 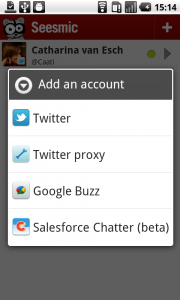 2 A dialog appears asking to choose the kind of account you want to add. 4 ... and tap the 'Sign in' button. 5 A progress dialog tells us the app is adding my new account. 6 And when finished, a toast message confirms that the account has been added. 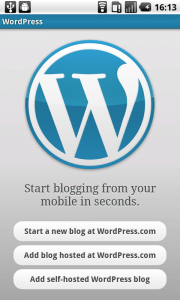 1 When no accounts have yet been added to Wordpress, the start page shows 3 buttons. 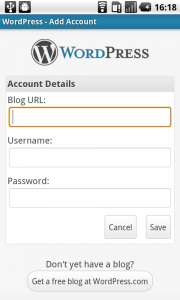 The bottom 2 can be used to add a blog (account) to the Wordpress app. 2 The account details have to be entered: the blogs URL, username and password, and when finished the button 'Save' can be tapped. 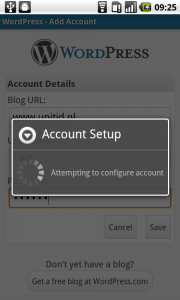 3 The account is being set up, says a progress dialog. 4 And when finished, the blog is added to our opening page.